Rover Trailers, All Over Rover, rock crawling with a Lock 'N' Roll. Expedition UTV pulled out all of the stops on the Project XPD build. Guess which hitch they used? 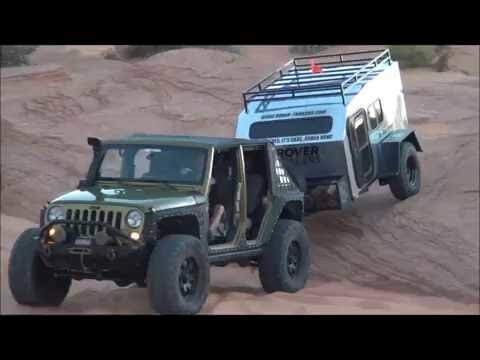 Doug Williams takes the Adventure Trailers Chaser trailer through Kane Creek, Moab. The trailer shows it's high ground clearance and independent suspension. Great footage! While attending the 2012 Overland Expo event we figured we'd give a go at the Land Rover course fully loaded and trailer in tow. We've been through our share of trails with our trailer and weren't sweating it, but the officials were a little hesitant to approve. After signing the waiver, explaining our background, vehicle capabilities, discussed our COG and multi-axis hitch, we were soon on the course with an official in the passenger seat.